The picturesque fishing village of Emsworth in Hampshire is located on the south coast (between Chichester and Portsmouth) in the upper reaches of Chichester Harbour. By Road – Emsworth is on the A259 and is clearly signed from the M27/ A27 between Havant and Chichester. By Rail – Emsworth Station is on the Southern Railway Brighton/London Victoria line with frequent trains along the south coast. The nearest mainline station is at Havant, with regular rail service to London Waterloo. Buses – The 700 Coastliner route has frequent services along the A259, from Portsmouth and Havant to Chichester and beyond. On foot – There is still no pedestrian access between north and south Emsworth under the railways bridge in North Street. There is an alternative route via Coldharbour Farm Land and Washington Road. 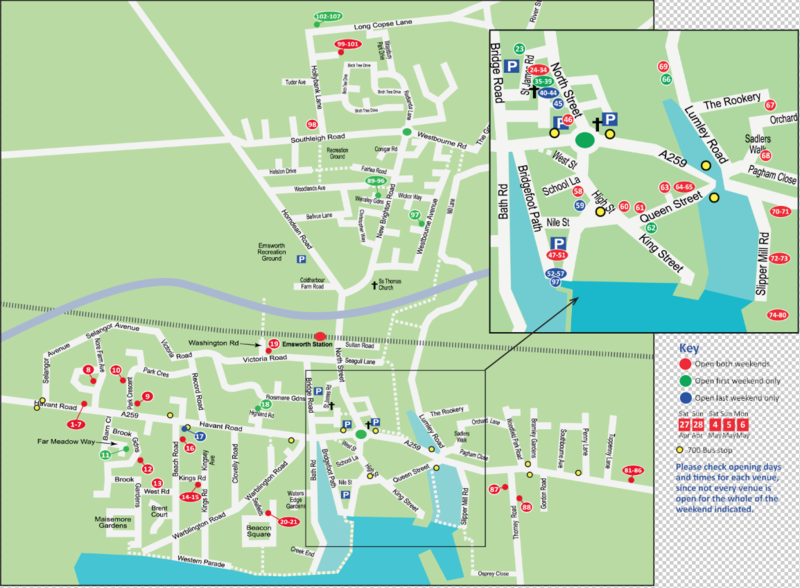 Parking – In the centre of Emsworth, there are three pay-and-display car parks and some free on-street parking restricted to 45 mins. Although these car parks tend to fill up quickly, therein plenty of free on-street parking just a short distance away from the centre, and most of the venues away from the town centre also have plenty of free parking.